Whether you’re looking for a stylish designer piece or a practical cooker hood, this guide is here to explain the important points about cooker hoods and to help you choose the right model for your kitchen. We will look at extraction rates, ventilation type and some important issues about design. Kitchen cooker hoods are appliances designed to be placed above a hob/Cooker to filter the air in your kitchen. They come as either ducted or recirculation models (more about both of those later) For many people a kitchen extractor is just an afterthought but not having adequate ventilation can lead to permanent damage to your kitchen as grease can stain your paint work and builds up in hard to clean places, as well as this odours linger in your home when sufficient ventilation is not installed. M³ Volume of kitchen (Length x Width x Height) then times this by 12. This is to allow for 12 recommended changes of air per hour. Example: Your kitchen is 6 metres long, 3 metres wide and 2.5 metres high. Multiply the room’s length x width x height to get the cubic capacity: in this case 45m³. If you wanted 12 changes of air per hour, then the extraction rate required would be 12 x 45m³, which is 540m³. So any cooker hood you consider should have a minimum extraction rate of 540m³/hr. We highly recommend using a cooker hood with more than the minimum extraction rate required. We also highly recommend using 6" circular (or rectangular equivelent) ducting, this will allow for the highest extraction rate as you will not be restricting the airflow by using a smaller size ducting. Most of the cooker hoods we sell can be set to either an extraction or a recirculation mode. Extraction should always be your preferred option, but here we look at the pros and cons of both types. Steam and odours are removed from the kitchen to the outside of your house via ducting. A filter containing activated charcoal is used to remove odour and smoke from the air, before releasing the ‘scrubbed’ air back into the kitchen. motor due to back pressure blowing back down the hood. You will tend to find not all odours will be collected by the charcoal filters and may linger for longer. When recirculating ceiling hoods, you must take into consideration how the air is going to be recirculated back into the room. For instance, when recirculating a wall hood you will have vents on either side of the chimney section that allow the "scrubbed" air to flow back into the kitchen. This rule also applies to ceiling hoods, therefore not all ceiling hoods that are being installed this way can be fitted flush. You have 2 options in which you can install a recirculating ceiling hood. 1. To enable a flush fit you would need to consider how the air is going to come back into the room, one way is to run a short piece of ducting from the motor back into the room. 2. Alternatively, you can install the hood in a drop down box from the ceiling and then install vents at either side to allow the air to recirculate. Not doing this, and simply allowing the air to be ducting into a ceiling void/ Loft space can create smells in the room above, but more seriously it can create damp and moisture as the steam and warm air is being blown into that space with no ventilation. If air is being recirculated through the cooker hood for release back into your kitchen, it is taken through two filters: a grease filter and a charcoal filter. All cooker hoods come supplied with a grease filter, but not a charcoal one; these can be obtained through the product page as an optional extra or there is dedicated spares and accessories section on our website. The charcoal filter needs to be replaced every 2-3 months or every 50 hours of cooking whichever comes first, depending on how often you use your cooker hood. The metal grease filter can either be replaced, or washed - usually in the dishwasher - if it is a permanent metal filter. In order to maintain the motor and keep it in good conditon, we recommend to clean you metal grease filter on a monthly basis, if using charcoal filters they must be replaced every 2-3 months, by not doing this a build up of grease can solidify on the motor blades and cause your motor to malfunction over time. by cleaning/replacing the filters regulrly this will help maintain the motors life. Ducting kits aren’t supplied with our cooker hoods and can be obtained directly from the product pages or the spares and accessories section on our website. Alternatively, generic ducting is available from all good DIY stores. We Specify that a minimum of 5" (125mm) round ducting must be used on ALL our hoods unless stated otherwise however we do recommend the larger 150mm ducting if your builder gives you the go ahead – this will offer a slightly improved airflow rate, since the ducting is a bit wider, and reduce vibration as the airflow is increaced. The hole in the wall MUST be increased to the same size as the ducting being used, if it is smaller you must not push a 5" ducting hose through a 4" hole in the wall. Installing any of our hoods on smaller ducting will invalidate your warranty as this overtime will damage your motor due to restricted airflow. Rigid ducting will also offer improved airflow and less noise over flexible ducting. This is because flexible ducting – even when pulled fairly taut – has ridges that slightly inhibit the flow of the exhaust air. Please also install with the minimal amount of bends in your ducting run as possible as this each bend will reduce the extraction rate by 1/3. Please note extraction rates quoted on our products are unrestricated, once ducting is added plus any bends your output will reduce, please take into account the longer the ducting and more bends added the less extraction you will receive. The larger the duct, with the shortest and straighest run as possible will acheive the best extraction results. The noise of the hood can be somewhat intrusive when on intensive or high speed, Stud walls will always be noiser than if installed on an outside wall due to the hollowness of the wall itself, therefore vibration will make the unit noisier than normal, to reduce this we recommend to use larger ducting if possible (6"). Please also note that, your builder may have used the recommended 5"-6" ducting however we often find that the hole in the wall as not been increased to the same size as the ducting and has been left as a 4" hole. This MUST be increased to either the same size or larger than your ducting that is being used as not doing so will effectively mean that your hood is running on 4" ducting, and will cause vibration and back preassure on the motor. If you find this is the case please Stop using your hood and increase the hole in the wall as soon as possible as continueing to use your hood on 4" will damage the motor. The larger the ducting used, the less vibration meaning the fan will be less noisey then if on a smaller ducting. Even taking all this into consideration, sometimes the acoustics of the room itslef does have bearing on the noise level being heard. A good tip, especially if you're eating in the kitchen, is to switch the hood on a few minutes before you start cooking to get air circulating in advance. You can then switch it off or to the lowest setting when you sit down to eat, and it will have done its job. If you have an induction hob, then buying an extractor is slightly different than if you have a Gas or Electric hob. 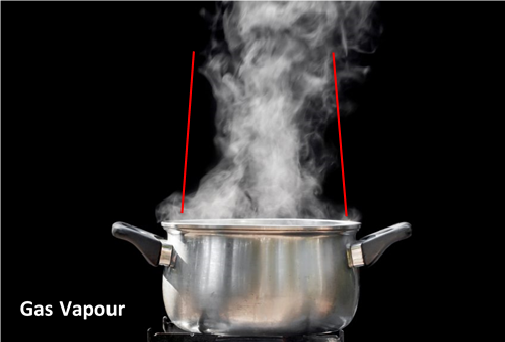 Due to induction hobs not generating any heat by thermal conduction from a flame or an electrical heating element, the steam that is generated in the pan disperses differently. 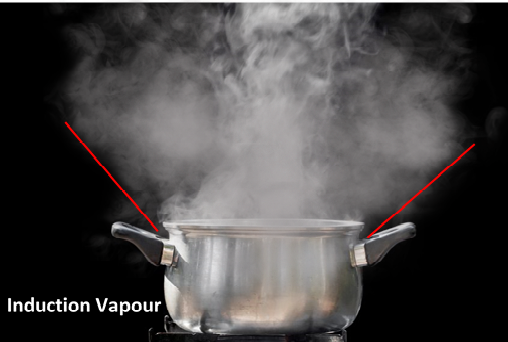 When using a hob with a flame/heating element, this helps the steam rise from the pan quickly before it turns from steam to water and is extracted before this process happens, the heat also warms up the hood at the same time meaning less chance of condensation collecting,as the warm air is not hitting a cold surface turning it into water. As induction Hobs do not work in this way and are electromagnetic, this means they do not generate direct heat and the steam that is being generated in the pan is slowly rising and dispersing immediately rather than being forced up, and warming up the extractor at the same time. Because of this, this often causes significant condensation and is something that unfortunately cannot be avoided as the steam is often already turning into water as it cools down when rising. When buying a cooker hood with an induction hob we always recommend to buy x2 sizes larger than the hob, for example if your induction hob is 60cm then we advise to buy an extractor with at least an extraction area of 80cm (this does not include certain products where the glass is 80cm and the body's extraction area only being 60cm ) as this will help collect the steam better that disperses around the sides of the hood from the pan, before it turns into condensation. Recirculating & Angled hoods are not recommended for Induction hobs due to the humidity / moisture caused by the hob. If condensation occurs it is advised to leave the hood running for at least 20 miiutes afterwards and the excess moisture will need to be removed by additional airing which will lead to loss of heat. You'll need to position the hood at a minimum of 750mm above a gas hob, or 650mm above an electric hob. This is different for Angled hoods and the position changes to 500mm for either gas or electric. When purchasing a cooker hood you will need to make sure the size of the extractor is either the same size or larger than your hob to avoid steam escaping around the edges when on the lower settings. Please also remember not to tighten any screws that hold the glass in place too tightly to avoid the same situation. We also advise you to duct the shortest route possible and on the largest ducting that will allow. Please also install with the minimal amount of bends in your ducting run as possible as this each bend will reduce the extraction rate. These extractors will work with either Gas/electric or induction hobs and can be installed a few millimetres away from your hob but recommend no more than 200mm for best results. All of the Luxair splashbacks should be installed with Clear mirror adhesive and not a white silicon based glue as this can tend to show through the paint once it has dried. and will ensure your splashback does not crack or shatter. Hobs should be installed a minimum of 2cm away from your splashback so there is no direct heat from the back burners. All our Glass is made from toughened glass and is designed to shatter into small pieces rather than shards if the above ever happens due to incorrect installation. This cooker hood also has easy access to grease filter with a flip down glass front panel, very high extraction rates 950m³/hr and must be fitted on minimum 5” ducting. All Luxair wall mounted hoods come with a free 7 years warranty. Finished in a stunning easy to clean stainless steel body with a black glass front control panel, this cooker hood looks stunning with a glass splash back in black or silver. This 52cm canopy hood from Luxair features an impressive extraction rate and comes with a 7 year warranty. This is NOT a Ceiling hood. This 60cm black chimney hood from Luxair offers excellent extraction rate at great value. The LA-60-CVD-BLK kitchen hood comes with two energy saving halogen lights and impressive high extraction rates of 680m³/hr, the glass is 8mm safety glass and the cooker hood body is fully welded and hand finished in Eggshell Matt Black Paint. This 60cm black chimney hood from Luxair offers powerful extraction at a great price so it's perfect for those on a budget. This 60cm chimney hood from Luxair offers powerful extraction for a great price so it's perfect for those on a budget. The Luxair LA-90-CVD-BLK kitchen hood comes with two energy saving halogen lights and impressive high extraction rates of 680m³/hr, the glass is 8mm safety glass and the cooker hood body is fully welded and hand finished in Eggshell Matt Black Paint. This new stunning designer ceiling extractor is the very best in quality, handmade masterpiece. The new Delux has been designed to fit flush on to your ceiling or into a drop down box lowered from your ceiling. This hood has an impressive 950m³/hr energy efficient to keep your energy usage to a minimum and 4 bright energy efficient LED spot lights. A remote control opperates the lights + motor and there is also a switch unit on the hood to operate it manually. The 90cm flat cooker hood has a modern crisp and easy to use push button back lit control with boost timer that switches the motor off after 15mins once pressed. Featuring 4 x 20w halogen lights to bring our stunning Luxair design to you kitchen, If slims your thing then this hoods is in! The Luxair LA-90-STD-BLK offers powerful extraction at a great cost. It's perfect for those on a budget. This Luxair cooker hood offers serious extraction at great price, perfect for those on a budget. 120cm x 30cm Anzi Hood in S/Steel For use with External Motor (Sold Seperately) - See Motor Options at the bottom of page. 120cm x 30cm Anzi Hood in White For use with External Motor (Sold seperately) - See Motor Options at the bottom of the page.